On Tone 13 we Ascend to a Higher State of Consciousness. 13 completes the 7 days and 6 nights of Creation. 13 is the number of theurgy, the ability to call on Divine Intervention through our prayers, rituals, and sacred ceremonies. There are Important Times and Places, when we know we are capable of greater things. Flint/ETZNAB clears the way with a Sword of Truth along a Lightning Strike. ETZNAB is also known as Mirror, like the Obsidian Mirror that always reflects the Truth. Flint’s truth is written on their face, and Flint sees truth reflected from others. Flint bring Truth that’s Unexpected, and yet it’s Truth we already Knew. It’s Truth that one side or the other covered up, or intended to be hidden. Flint is said to present a temptation to “act out of character.” More likely, Flint is trying to reveal who we are. It’s not a day for knee-jerk reactions. If we pay attention, we’ll have Time to make the Choice. We set out to learn how to draw a Divine Family together. We learned that everything is a Choice, if we would only Remember to Choose what we want. We are MEANT to find something that WE Love Enough to really give our Self to. We might suddenly realize a Dream of something we’d Love to do. Maybe we didn’t think the Time would lead us anywhere, but one Creation always inspires another. We only have to choose something we Love Right Now. CIMI offered the Comfort of a Distraction by sharing a Blessing in the Future, we Knew we could Believe. 13 Flint/ETZNAB is an Ascension of Truth as an Answered Prayer. The glyph illustrates the pyramid from a perspective directly Above it. We are Ascending to Truth that we Believe. We can See it by our Consciousness of Spirit. We won’t need any evidence to Know that the Happiness we Dream of Makes a Difference to the Whole. ETZNAB seats the Consciousness of Our Own Truth, and sweeps away any doubt that we can see the future. We can Change the Future by asking for the Happiness the Creator planned for us. We’ll Already Know the Answer to that Prayer. In our own way, we can generate the sparks of Believing for the Whole. Sometimes someone else just needs to hear, “Everything is going to be okay.” We can hold a Family together when We Believe. Transformer/CIMI taught us to navigate the Chaos of Change by Remembering our Prayers for Harmony and Justice were Answered before we ask. We are really asking to Stand on the Truth we Believe, because we Believe it – and because a Supreme Creator didn’t place any conditions. Given Free Will, the Creator has to wait for us to Ask. Flint/ETZNAB can offer a True Reflection of Us in the Mirror. We might see something genius in our Self. We might realize an idea was brighter than we thought. This is a Day to Celebrate our own Truth. We can stand on it until we find out something better. If our ground hold us, others will be willing to follow along. Our journey, like the Heron is rising from the Ashes of our Past, and to keep moving on toward brighter opportunities. We can pick the one we Love Most NOW. Who knows where it might lead? To all my relations, may we Celebrate the Faculties we were given to figure things out. May we give thanks in advance for a Truth that will Make a New Way. May we never fear the Truth that will always set us Free. May we believe in our own Knowing and how our Own Truth Feels. May We Know the Truth “We Know” is important – the most important Truth for every choice we make. Thank God we can all have our own Truth, and One is no less worthy than another, when while we’re creating we’re asking for the same Happiness for the Whole. May we ask for a Provision so that if we are Tempted we will Remember in Time to make the Wise Choice. 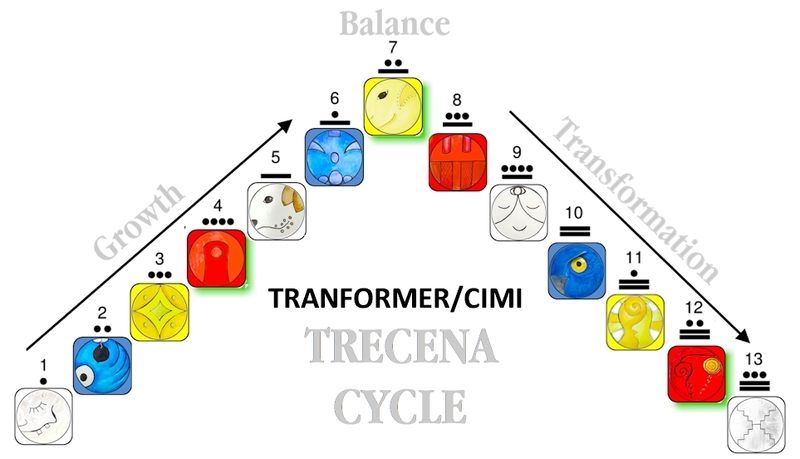 Visit the 13-Day Trecena Guide for a daily energy forecast with insight on the Uinal and Portal Days of the Transformer/CIMI trecena. Flint/ETZNAB: Mirror of reality. As a struck flint, these persons are the divine sparks of intelligence. Flint’s innate abilities are utilized to discriminate emotions from fact. Flint persons stand tireless to protect, defend, or cure others by personal sacrifice. By courageously wielding the sword of truth, falsehoods are cut away. Flints, it was said, can receive information on inter-personal troubles or evil plots of others by reflecting in an obsidian mirror. Their valiant service as warriors of the truth must be impeccable or they will experience sufferings of accidents, misunderstandings and gossip.